3. And they said one to another, let us make brick, and burn them thoroughly. And they had brick for stone, and slime had they for mortar. 4. And they said, let us build us a city and a tower, whose top may reach unto heaven; and let us make us a name, lest we be scattered abroad upon the face of the whole earth. ... 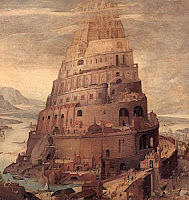 In the matter of Babel, the wrong choice was made [namely, how to use the gift of time], the wrong intention underlay that choice [in other words, to serve ego rather than to glorify Divinity], the wrong methodology was used to try to reach God [i.e., that of external, legalistic, arbitrary, rule-governed methods rather than through principle-bound indigenous, esoteric methods] and creative imagination was inappropriately used and called upon to serve human purposes rather than Divine purposes, and although the people of Babel got their wish – a name for themselves – it was not quite what they had in mind when they started their venture. Today, we [meaning the Jewish, Christian, and Muslim peoples], who are the inheritors of the Abrahamic Prophetic tradition, often find ourselves to be uneasy if not hostile neighbors of one another. We find ourselves this way because, among other things, of what we have inherited from the times of Babel … we have become separated through the confusion of communication … we have become separated and isolated from one another through our collective wrong choices, and our collective wrong intentions, and our collective use of problematic methodologies, and our collective use of inappropriate modes of creative imagination, and of our collective failure to take responsibility for the many consequences which are the direct and indirect result of all that we, collectively, are doing wrong with respect to choice, intention, methodology, and creative imagination. We always have grievances against one another, and only very rarely do we have grievances against ourselves. Yet, the world is like it is today because we are like we are today… it is not the other who is at fault, it is we who are at fault. Benjamin Franklin is reported to have said that insanity is to keep doing the same things while expecting different results, and if this is the definition of insanity, then, many of us qualify to be so diagnosed. - Dr. Anab Whitehouse / excerpt from the text of an excellent talk given at Fordham University, New York City - Sufi Circle Interfaith Conference, April 2007 . [>] read full text here. [SUFI PODCAST] Anab Whitehouse hosts the Sufi Podcast. His latest podcast can be downloaded and listened here. / past Sufi Reflection Podcasts can be found here.